Amble INN is located in Mt Barker opposite the sweeping fairways of the local golf course and is in walking distance for the avid golfer. If golf is not your thing, there are many walking/bike trails in the vicinity where you can go for a ride, stroll and do some bird watching too. You could also take a trip to the top of Mt Barker to view the rolling Adelaide Hills or the sweeping plains towards the River Murray. Mt Barker is a good central location to venture out to nearby wine regions, historical sites and enjoy some scenic drives. You can sit in the outside entertaining area to relax with a drink or prepare a meal on the gas BBQ. 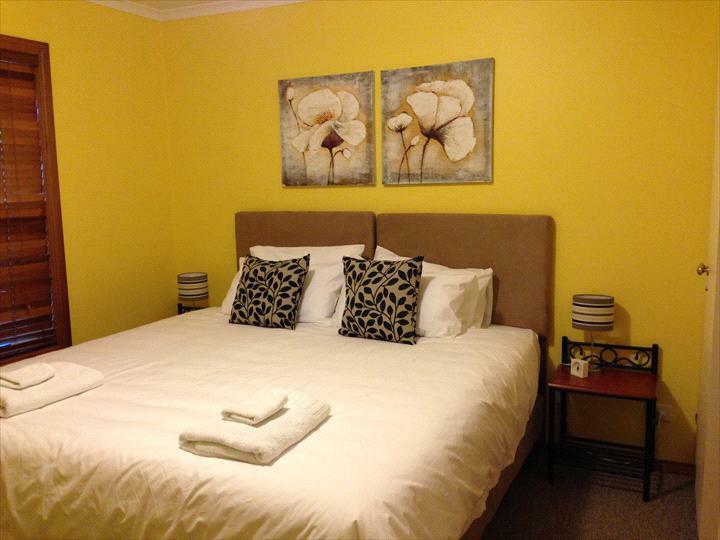 This venue can offer either six single beds or three king beds or variations of these as required and would be suitable for families or small gatherings. PLEASE NOTE: This venue is Pet Friendly and Minimum Stay is Two Nights. Amble INN is located in Mt Barker ideally situated within walking distance for the avid golfer, opposite the sweeping fairways of the local golf course. If golf is not your thing, there are many walking trails in the vicinity or you may decide to take a trip to the top of Mt Barker to view the rolling Adelaide Hills or the sweeping plains towards the River Murray. You can sit in the outside entertaining area and relax with a drink or prepare a meal on the gas barbeque. We stock the venues with some special things (included in the tariff) to make your stay even more enjoyable. Where possible and when we know we can maintain quality, we source from the local area. fresh orange juice; low fat milk; wholemeal bread (gluten free available on request); spreadable butter; Vegemite; jams & sauce (gluten free); cereal. fresh orange juice; ground plunger coffee; low fat milk; wholemeal bread (gluten free available on request); spreadable butter; Vegemite; jams & sauce (gluten free); cereal (contains gluten); natural muesli; bacon; fresh tomato and eggs; baked beans. AVAILABLE ON REQUEST WHEN BOOKING: Alternative Dietary Requirements can be supplied for an extra cost. Please Note in the comments section your Alternative Dietary Requirements when booking. We can cater for Gluten Free, Vegetarian and Vegan diets. Minimum Stay is Two Nights, standard bed configuration is a King Bed in Master Bedroom and Queen Bed in 2nd Bedroom. Cancellation policy A full refund of any deposit paid will be given if the booking is cancelled more than 30 days prior to arrival. We recommend that you take out travel insurance to provide protection against loss due to illness injury loss of luggage and cancellation of travel.